With the forecast of rising sea levels in the news on the Seacoast, archaeologist Peter Leach will talk about 7,000 years ago, the time that one could walk from the mainland to the Isles of Shoals, and how ecosystems and human populations have responded since then to rising sea level. Leach will explain his research along the New Hampshire coast, including the drowned forest at Odiorne Point. He will show how archaeological data can be used to help assess the future impacts of sea level rise and how people and ecosystems might react. 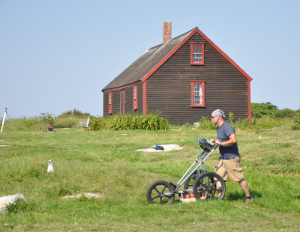 Leach is a doctoral student at the University of Connecticut, specializing in submerged prehistoric archaeology, and has conducted ground-penetrating radar surveys on four continents. His free talk (sponsored by the Isles of Shoals Historical and Research Association, ISHRA), is on April 12. Doors will open at 6:30 pm for the 7:00 pm event at Discover Portsmouth. From the north: I-95 south, Exit 7 to downtown historic Portsmouth, turn left at the end of the exit onto Market Street. Go through 3 sets of lights on Market Street, get in the right lane to take a slight right turn on Russell Street, past the Sheraton on your left, then turn right onto Deer Street. Turn left at the light onto Maplewood. At the second set of lights (at Congress and Islington St.) Discover Portsmouth will be on your right across the intersection. The closest 2 lots to Discover Portsmouth are the Bridge Street lot and the Worth lot. The Bridge Street lot is directly across Islington Street from the Center. The Worth lot is on Maplewood behind the Portsmouth Health Food Store. This entry was posted in News on April 1, 2016 by cbd232.